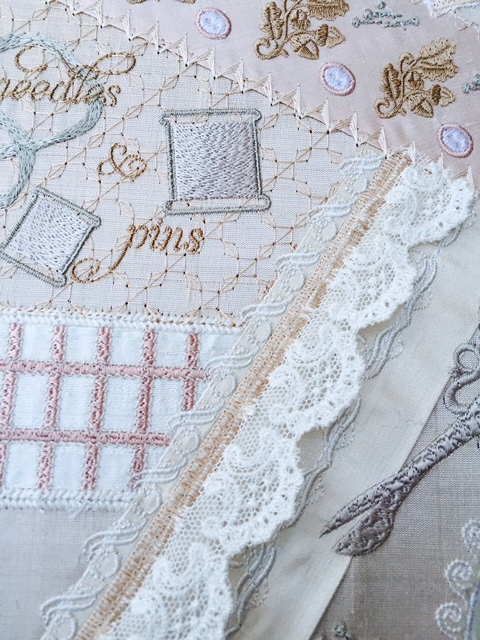 I am currently digitising another Crazy quilt block with a vintage sewing theme. In deciding the elements for this block I have considered all the notions we use when we sew and given them a neutral colour scheme to make them appear vintage! This is my largest block as it is rectangular rather than square. There are a pair of scissors, threads, buttons and buttonholes, clusters of pins, a threaded needle, an elastic looking column to hold some lace in place if you want, ribbons and a thimble! For a change there are also some special “words” to add to the theme. I hope you will like them all and as yet nothing has been added to make it truly “crazy”! We will all have fun embellishing this one. This is my most complicated block so far too as I have added more features, techniques and possibilities which I will share next time around. The image above shows the first edition of the block before I tested it out and made any adjustments. It fits the 12″ by 8″ hoop and once finished I will design a smaller one for the 5″ by 7″ hoop. Just think what you can create with a rectangular block. When I watched it stitch it out I decided to make quite a few significant changes which I think you will love! Now for the exciting part to show you my stitch out which even though it is far from perfect I love it and will put it up in my studio. 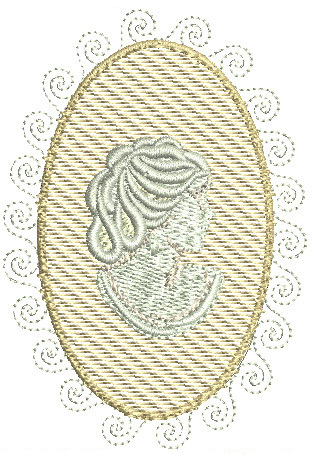 Those who know me will not be surprised to see it has been stitched out on silk dupion. As you can see I have attached some precious Nottingham lace and have also just folded one of the fabric pieces too! Some of the embroidery has been done in Sulky Cotton 30wt as I wanted to introduce more neutral colours and depth. I just love the look that this gives as it emphasizes the stitches. The little oval buttons at the top need to be cream or ivory as the white is too stark but most of the colours worked well. This is the top section of the block. The clusters of pins need to be made less dense but the oak leaves and acorns look wonderful. Lastly there is an option with this block within the oval applique. As I was asked this week to include a cameo in one of my blocks I decided to add it to this one instead of the words “love to sew”. 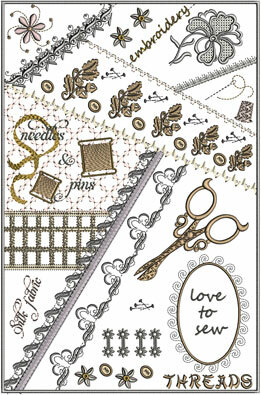 This Romantic Crazy Quilt block will be released at the end of the week! Catch yours now by visiting the Members area on my website if you belong to my Embroidery group or join us now so can get access to this and so much more….. 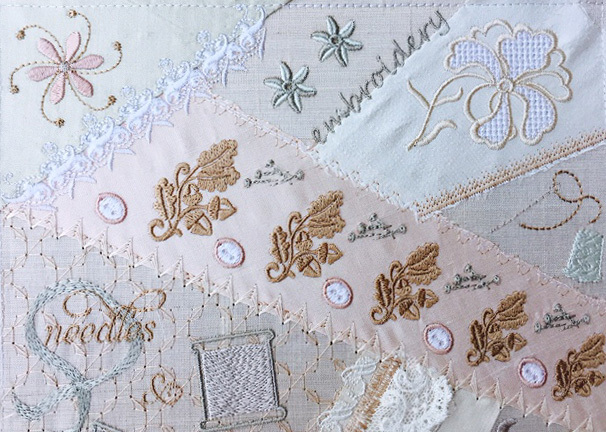 This entry was posted in Discussing machine embroidery, New Designs and tagged Crazy quilting, Heirloom, machine embroidery. Bookmark the permalink. I´d rather like the “Love to Sew” oval frame better. The good thing is that it can be easly changed with the right software. I don´t sell my work so that is OK. Thanks Hazel for the lovely work you do. I just love all your designs. I will prepare two versions of the block. Glad you like it as I had such fun creating it. It’s beautiful! It’s going to be perfect for my studio. Your designs are amazing! Hazel. I have a question for you, I have purchased some crazy cool designs from other digitizers. Part of their design incorporates adding the fabric and then the stitches. Do your designs include the stitching of the fabric as well as the designs? Sorry to miss your question last week. Yes I prepare a very detailed PDF showing you how to attach the fabric for both sizes. This block is different from my other ones in that some embroidery is done on some fabric pieces before the next piece is added. This gives a much neater appearance. let me know if you have any further questions. Thank you Hazel. Some of my wording didn’t come out clearly. Is the block all done as an in the hoop embriodery or do you have to sew on the individual pieces of fabric? Yes everything is done in the hoop including attaching the fabric pieces.